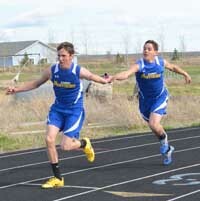 Courtesy photo by John Peck Carey senior Charlie Rivera (right) hands off to senior Jack Cenarrusa during the second-place Panther 4x200-meter relay Thursday in Carey. The Camas County High School Mushers have already showed they are ready and willing to contend for the State 1A track and field championship in May. The Musher girls and boys won last Thursday's 14-school Carey Invitational. Led by the 40-point performance of senior Katelyn Peterson, the Musher girls used good balance and a 50-point field event effort to out-distance the second-place Carey Panther girls by a 111-89 margin. Peterson won high, long and triple jumps, and added the 300-meter intermediate hurdles win. Camas junior Stephanie Moore captured the 200-meter dash for the fifth gold of the day for the Musher girls. The Carey girls got a 3200m victory by junior Jaide Parke in addition to three relay wins—4x100m, 4x200m and sprint medley. Parke (26 points) and senior Micaela Adamson (21) led the Panthers into second place. In a very competitive boys' field, the Musher boys earned six gold medals and piled up 56.5 points in field events to edge second-place Lighthouse Christian Academy of Twin Falls by a 91-84 count. Carey's boys led by long and triple jump winner Charlie Rivera finished fourth with 70.5 points. Thursday's Musher winners were junior Jordan Robles (shotput, discus), senior Airik Donohoe (3200m), senior Andrew Simon (high jump) and two relays—the sprint medley by 1.80 seconds and the 4x400m relay by 12 seconds. Other individual stars were: Richfield senior Sasha Kent winning the 800m by 20 seconds, 1600m by 18 seconds and 400m by 1.5 seconds; Castleford junior Ty Zimmers taking the 100m and 200m sprints; and Murtaugh senior Humberto Pacheco capturing the high hurdles and intermediates. Teams: 1—Camas County 91 points (4.5 sprints, 0 hurdles, 10 distances, 56.5 field, 20 relays). 2—Lighthouse Christian 84 (22 sprints, 8 hurdles, 18 distances, 8 field, 28 relays). 3—Hagerman 73.5. 4—Carey 70.5 (3 sprints, 6 hurdles, 3 distances, 38.5 field, 20 relays). 5—Murtaugh 69.5. 6—Castleford 66.5. 7—Hansen 58. 8—Dietrich 39. 9—Shoshone 32. 10—Glenns Ferry 23. 11—Butte County 21. 12—North Valley Academy 16. 13—Richfield 5. 14—Bliss 3. 100m: 4—Andrew Simon (CC) 11.70. 8—Charlie Rivera (C) 12.00. 200m: 6—Jack Cenarrusa (C) 24.70. 800m: 6—Jake Purdy (C) 2;27.60. 3200m: 1—Airik Donohoe (CC) 11:34.90. 110m high hurdles: 3—Dillon Cenarrusa (C) 17.10. High jump: 1—Andrew Simon (CC) 5-10. 2—Isaac Simon (CC) 5-8 and Cody Lane (CC) 5-8. 4—Davey Knowlton (CC) and Jack Cenarrusa (C) 5-6. Long jump: 1—Charlie Rivera (C) 20-6.75. 3—Luis Garcia (C) 18-11.75. 6—Davey Knowlton (CC) 18-3.75. Triple jump: 1—Charlie Rivera (C) 40-7. 5—Colton Rasmussen (CC) 35-11. 6—Luis Garcia (C) 35-10.5. 8—Brandyn Williams (CC) 35-6.5. Shotput: 1—Jordan Robles (CC) 42-1. 5—Francisco Gamino (C) 39-9. Discus: 1—Jordan Robles (CC) 130-7. 8—Chance Chavez (C) 105-4. 4x100m relay: 5—Carey (Dillon Cenarrusa, Luis Garcia, Jordan Dilworth, Tori Alvarez) 48.60. 4x200m relay: 2—Carey (Luis Garcia, Christian Zarate, Charlie Rivera, Jack Cenarrusa) 1:39.10. Medley relay: 1—Camas County (Andrew Simon, George Simon, Cody Lane, Davey Knowlton) 3:52.50. 4—Carey (Dillon Cenarrusa, Jordan Dilworth, Christian Zarate, Jake Purdy) 4:10.50. 4x400m relay: 1—Camas County (Andrew Simon, Cody Lane, Airik Donohoe, Davey Knowlton) 3:46.20. 6—Carey (Nate Adamson, Jordan Dilworth, Jake Purdy, Dillon Cenarrusa) 4:05.00. Teams: 1—Camas County 111 points (16 sprints, 15 hurdles, 14 distances, 50 field, 16 relays). 2—Carey 89 (17 sprints, 8 hurdles, 26 distances, 8 field, 30 relays). 3—Butte County 71. 4—Hagerman 69. 5—Richfield 66. 6—Castleford 51. 7—Hansen 34. 8—Shoshone 32. 9—Dietrich 31. 10—North Valley Academy 30. 11—Murtaugh 21. 12—Lighthouse Christian 12. 13—Glenns Ferry 10. 14—Bliss 1. 100m: 5—Daphne Kirkland (C) 14.20. 6—Arriana Nielson (C) 14.30. 8—Annie Cline (C) 14.70. 200m: 1—Stephanie Moore (CC) 29.30. 2—Angelica Zarate (C) 29.40. 8—Arriana Nielson (C) 31.10. 400m: 3—Larissa Stewart (CC) 1:07.00. 800m: 2—Jaide Parke (C) 2:45.70. 1600m: 2—Jaide Parke (C) 6:02.20. 3—Brittani Hulme (CC) 6:29.30. 3200m: 1—Jaide Parke (C) 12:46.10. 2—Brittani Hulme (CC) 14:25.50. 100m high hurdles: 4—Carlie Strom (CC) 19.80. 300m intermediate hurdles: 1—Katelyn Peterson (CC) 49.70. 2—Micaela Adamson (C) 50.50. High jump: 1—Katelyn Peterson (CC) 5-0. Long jump: 1—Katelyn Peterson (CC) 16-7.25. 2—Stephanie Moore (CC) 14-10.5. Triple jump: 1—Katelyn Peterson (CC) 35-3.5. 2—Micaela Adamson (C) 32-10.25. 3—Stephanie Moore (CC) 31-4. 6—Kylie Walker (CC) 28-7. Shotput: 7—Jessica Lanier (CC) 29-5. 8—Sierra Sabin (CC) 27-9. 4x100m relay: 1—Carey (Daphne Kirkland, McKayla Mecham, Arriana Nielson, Angelica Zarate) 55.20. 2—Camas County (Stephanie Moore, Sierra Sabin, Carlie Strom, Larissa Stewart) 56.10. 4x200m relay: 1—Carey (Daphne Kirkland, McKayla Mecham, Angelica Zarate, Micaela Adamson) 1:56.30. Sprint medley relay: 1—Carey (Daphne Kirkland, McKayla Mecham, Angelica Zarate, Micaela Adamson) 2:00.40. 4x400m relay: 2—Camas County (Carlie Strom, Larissa Stewart, Sierra Sabin, Kylie Walker) 4:52.00.